I am a mom of 8, and 3 of those babies were born at home. I’ve had babies every way you can have them — home, hospital; doctor, midwife and unassisted; drugs and natural; water and land; long labors, short labors. In 1997, I took my first natural childbirth class. I was pregnant with my fourth baby at the time. During the course of that pregnancy, I discovered homebirth and my love for all things birth related. It was upon meeting my midwife that I realized my calling to the work of midwifery. I began teaching Bradley Method® childbirth classes in the summer of 2001 and began my midwifery apprenticeship in January of 2003. After nearly six years of apprenticing, I completed the skill requirements for taking the NARM exam and passed the exam in August of 2009. I was a La Leche League Leader from 1996 through 2001. ​I received my didactic learning through the Midwives College of Utah, and hold a Bachelor's degree in the Science of Midwifery. My training and degree meets the ICM standards for midwifery education, and is endorsed by ACOG as the training and education required for a safe homebirth. I have a license to provide midwifery services in the state of South Carolina. I am a member of The National Association of Certified Professional Midwives, The Midwives Alliance of North America (MANA), The Georgia Midwives Association (GMA), and CSRA Birthing Connections. I am the President of the Palmetto Association of Licensed Midwives. Apprentices are an integral part of my practice. I learned my clinical skills in the traditional apprenticeship model, and I intend to pass my skills on to the next generation of midwives. My students will be involved in all aspects of your care and you will get to know them as well as you know me! Any skills performed by students is directly supervised by Christine. I'm an Army wife, La Leche League Leader, and mother of 8 children. 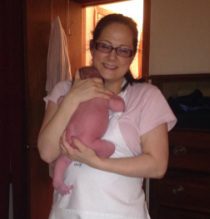 I discovered homebirth when I was pregnant with my second child. My birth experiences have covered the spectrum- one planned hospital birth, two unplanned c-sections, a wonderful midwife-attended HBAC, and an unassisted HBA2C waterbirth. I trained as a birth doula in 2005 and became certified through DONA. I attended my first homebirth in 2006 and attended several births as Christine's assistant. I fell in love with midwifery. Our family moved in 2009 and my husband deployed so I took a hiatus from birth work. We moved back to Augusta in early 2014 and I'm excited to be attending births once again. I am currently a Bachelors candidate at Midwives College of Utah and attending births as a Primary Midwife under supervision. Amity has always loved helping pregnant and birthing women, and her career in birth work began in 2010 when she became a doula. Although she served families in all birth settings, Amity knew almost immediately that she was being called to help women birth at home. She began her formal midwifery studies in 2012 through Ancient Art Midwifery Institute. Amity has attended over 60 births as a doula, and is overjoyed to move into the role of midwife's apprentice.